Though some books are small, they can definitely be mighty. Such is the case with From a Low and Quiet Sea by Donal Ryan. I came upon it last month, after looking for short and beautiful stories that would follow on nicely from I Found My Tribe, another product of Ireland. I adored Donal Ryan’s writing – it was the first book of his I have read – and read it in a couple of days. It’s a novel made of three main voices, each distinct but with commonalities, contrasts, and crossing paths, especially as the stories eventually come together. There’s Farouk, whose country has been torn apart by war. In Ireland, there’s Lampy, whose heart has been broken by Chloe. And there’s John, whose past torments him as he approaches the end of his life. As with much Irish fiction, From a Low and Quiet Sea is a book about home, identity, and journeys. I spent a few semesters studying these themes in Irish literature – from Joyce to Yeats, Joseph O’Connor, and Colm Tóibín. From a Low and Quiet Sea complements these authors beautifully, bringing in new ideas and identities but harking back to its Irish roots. At one moment, Farouk stands by the sea thinking about loss; of loved ones, of his past life, and of his country. He is a Syrian doctor, but there is something about him of Eveline in James Joyce’s Dubliners, who stands frozen at the harbour not knowing where to go next. But Joyce wrote wonderfully about universal themes. It’s a beautiful book, with characters pondering life, kindness, and what it all might mean. It’s also a sad book, with several moments that are very emotional. But that’s life, and the book covers topics that should be emotional, including tragic losses and perilous journeys. Donal Ryan’s decision to use his words to connect the refugee crisis with (perhaps seemingly disconnected) Ireland was a smart one. As with many of my favourite novels, this one crosses oceans, times, and backgrounds to create a brilliant story. But if you observe a man closely and properly you’ll eventually come to know the shade of his soul. No soul is brilliant white, save for the souls of infants. But there are men alive who will do evil without pause, who are without mercy, and there are men alive who would rather die than harm another, and all of the rest of us fall somewhere in between. And he talked on about the universe, and the oneness of all people and all things, how man was Nature’s way of seeing itself, of feeling what it’s like to be. And he said again to listen, to observe, to do your best to hear beyond the spoken, to see the quality of the light in another’s eyes. What’s in the past can’t be changed and what’s to come can’t be known and you can’t give your life to worrying. Sure you can’t. All you have to do is be kind and you’ll have lived a good life. 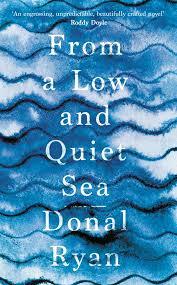 From a Low and Quiet Sea is Donal Ryan’s most recent book. I’m excited to have his previous novels ahead of me. Like more of the same? Subscribe to the Tolstoy Therapy Newsletter and receive a round-up of the latest articles to enjoy with your coffee. Click here to subscribe or take a look at an example copy here.